You can't beat the classics... but you can repeat them occasionally. In 1962 Hamilton introduced the Huntley. It must have been fairly popular, as it was produced through 1969. Initially it was offered with a very unique patterned dial with fancy 1960s numerals at 3, 9 and 12. 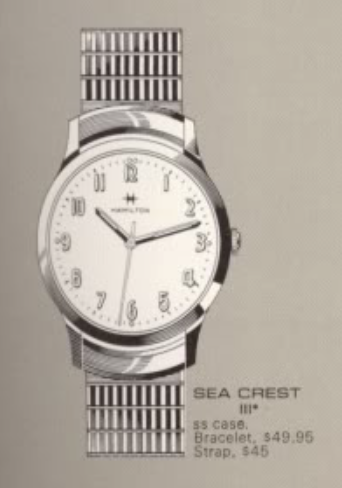 In 1964 the fancy pattern was discontinued in favor of a plain white finish on the marker dial and an all-numeral dial was added as an option. The price was also increased by $10 to $135. I'm not sure but I think the all-numeral dial might have had a textured finish as well... at least that's what some of the catalog images appear to show. So how is the Huntley a classic design, you ask? 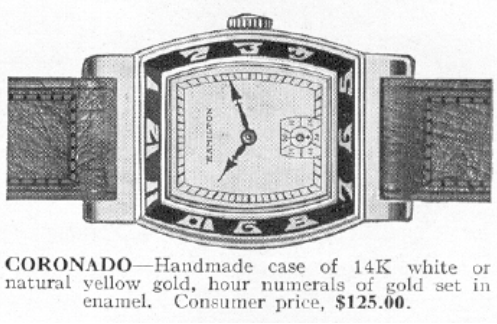 Well, it's 14K solid gold case is very reminiscent of the 1939 Brock which was made through 1952. I believe it also shares a crystal with the 1953 Brockton, although that case is 10K. So it's a bit of a blend between the two models, with a little extra 1960 spice thrown in. Unlike the Brock or Brockton, the Huntley has a 12/0 size 22 jewel 770 movement inside, certainly a step up from the 19 jewel 754 movement (although very similar) in the Brockton, although both are the same size. I recently received a 1962 or 63 in need of a little TLC. I know it's from that period because of the dial. It's actually in very nice shape, so it shouldn't be to difficult a project. Looks like one of the lower lugs is a little bent, but other than that it looks great. The only downside that I can see with the Huntley is it's a little on the small side compared to other 1960's models. 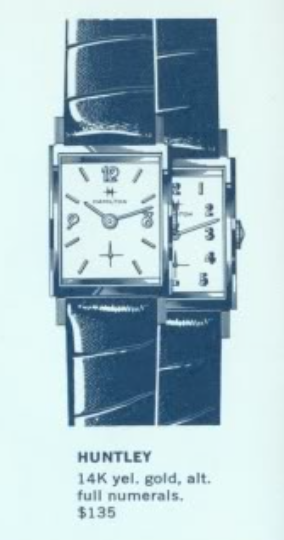 It's consistent with 1940's models, which tended to be smaller but watches were larger in the 1960's. One thing that isn't readily apparent with the bezel in place is the dial has a golden band going across the top and bottom. The pattern on the dial looks like a screen to my eye. It's an interesting look but I'd hate to have to get it refinished. The 770 movement is in great shape, it's a little dirty but nothing too distracting. The case back has a couple of service marks inside from past trips to a watchmaker. The 12/0 and 14/0 sized grades actually have two different length cannon pinion and hour wheel setups. So if you needed to replace a cannon pinion, you'd need to know which version. The Huntley has the longer version as it uses a spacer plate under the dial - that's usually a good clue which length is involved. The movement is now back together and ticking away nicely. If you haven't already seen them, I have step-by-step views of how to take apart or reassemble the various movement types posted in the "overhaul examples" page in the menu on the right side of the screen. Hmmm... the watch is running fast, even if I move the regulator to full slow. Something is not right. If you look really closely, you might be able to see that the hairspring is not inside the two prongs of the regulator pins. It's inside the inner pin and that's making the watch run fast. I'll have to gently coax it into the proper position. Ah... much better. The beat error is on the higher side of acceptable. It's not easy to adjust and could result in goofing up the balance so I'll leave it as it. The watch might stop a little sooner as it winds down than if the beat error was lower... but that's about the extent of the issue and it's pretty minor. Well, now the inside of the watch is running as nicely as the outside looks. 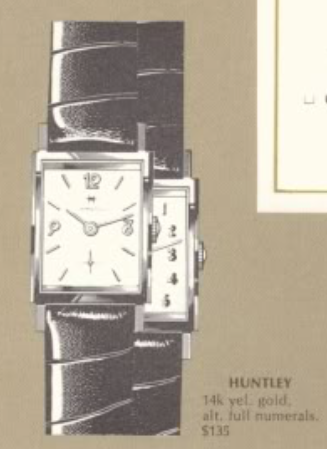 I like the looks of the Huntley with the patterned dial... it's interesting and a little unusual. One of my favorite quotes is often attributed to Michelangelo, supposedly said after he was 70 years old... "Ancora Imparo"... "I am still learning". Although I just celebrated my 500th watch post, there are many things that I still don't know how to do, or that I lack the necessary equipment to do. Certainly a "master watchmaker" ought to be able to make anything that he (or she) would need to fix a watch. Using a lathe, you can make balance staffs or arbors for wheels. Making a hairspring would certainly be tricky for anyone. Adjusting hairsprings is within reach of hobbyists and you can watch true professionals do what is best described as "magic" when it comes to hairsprings. A couple of my "watch heros" are from the UK... one is Christian Dannemann at http://watchguy.co.uk and another is Mark Lovick at http://www.patreon.com/watchrepair. You can learn a LOT, especially from Mark's Youtube channel... https://www.youtube.com/user/jewldood. If you know much about mechanical watches, you probably have heard about fine watches being adjusted to "six positions". That was a requirement for railroad grade pocket watches. The six positions are dial up, dial down, pendant up, pendant down, pendant left and pendant right. Lots of fine watches, including pretty much all of Hamilton's wrist watches, were adjusted to three positions... dial up, dial down and pendant down. The spec, as I understand it, was they couldn't vary by more than 30 seconds per day - but they are capable of much better performance than that. Adjusting watches to a particular position required running them for a long time in that position. It required a lot of effort to record how a watch ran, make an adjustment, then let it run again and record it's performance. Adjusting to three positions was viewed as "good enough" for everyday use. Anyway, I always check dial up and dial down when I overhaul a watch and usually one or two positions on the way from dial up to dial down. Typically things look fine and if there's a big difference between dial up and dial down, then the balance staff is likely the culprit. I don't usually pay close attention to performance in all six positions - mainly because there's not much I could do about it. Of course, if I saw something "bad", my go-to solution is to replace the balance in it's entirety. As a result, I have a depressing graveyard of bad balances and partial parts movements. I'm sure I'm not alone in the ranks of watchmakers who don't adjust watches to all six positions. Paul is a very special kind of crazy... and he really loves the cause and effect results of adjusting vintage watches to exemplary standards. His blog has taught me a lot about the theory and technique but there's no better teacher than experience. I'm a little crazy too, so I purchased most of the tools that are needed for this specialized task. As fate would have it, I recently had someone contact me about a watch he purchased last year that had stopped working for him after vigorously clapping his hands at a show. He also had a watch I sold him a couple of years ago that he thought ran great on his nightstand but differently when he wore it. I asked him to send me the watches so I could check them out. The watch that had stopped working was fairly easy to fix. The task reminded me that in the 1930's when these watches were made, there was a watchmaker in every jewelry store. Watches stopped all the time. Think about all the old black and white movies where someone said, "Do you have the time? My watch has stopped". The second watch was another story... and the reason for this post. The watch actually ran pretty well in four of six positions but I could see it varied dramatically in the other two. I could see why the experience while wearing the watch might differ from the nightstand performance. Apparently there is no time like the present to try these new techniques out. The watch is an Endicott, one of my favorite models and the first model that I ever purchased (not this particular watch though, just this same model). Plus it's anniversary just passed - it was given as a gift 74 years ago to Alfred from his mom and dad... a graduation present, I bet. Looking at the watch on the timer, it's running a little slow but the amplitude is good and the beat error is on the high side of acceptable. The regulator is set to full fast, so I could speed it up a little but not too much. Looking at the performance a little more closely, here's what I recorded at each position, plus the midpoints. You can see that it runs "fastest" midway between crown down and crown left. When a watch is fully wound, the energy of the mainspring can mask the variability of the balance weighting. The balance wheel has timing screws around the perimeter and they are what controls the balance of the watch. In combination with the hairspring, the weights can also change the speed of the watch. When you think about a spinning ice skater, when they pull their hands in they spin quickly. They push their hands out to slow down. So to speed a watch up you can remove weight and to slow a watch down, you can add weight under the same principle. But you have to add or remove weight in the right places, otherwise the performance will vary by the position of the watch. A perfectly balanced wheel is considered to be in "poise" or "poised". There are tools to check for poise with the balance removed from the watch but with modern timers, it's faster to check for poise by running the watch on a timer and looking at it's performance in various positions. To see what's going on with this Endicott's 987A, I will first thoroughly clean the movement, demagnetize it and set the regulator to the center. Then I'll give the watch a turn of the crown to get it running with low amplitude. Between the regulator setting and the low mainspring tension, the watch is running very slow now. I'll record it's performance in all six positions. Now the fastest position is Crown Left. Dial up and Dial down are fairly close. What's most important is the position where the watch is running the fastest... that means the heavy spot on the balance is directly below the balance staff. This may test your spatial geometry skills, but from the back, the left side is on the right in the shot below. So the heavy spot is on the balance wheel is below the balance staff, where my tweezers are pointed. Now with the balance removed, my tweezers are again pointed at the heavy spot on the wheel. From a tweaking standpoint point, I can remove weight from the heavy side or add weight to the lighter side. But which one should I do? Since the watch is running slow overall, I need to speed the watch up. To speed the watch up I need to remove weight. If it was running fast, I would want to add weight - and I could do that by putting a tiny washer under the screw on the opposite side of the heavy screw. Since I want to remove weight, I will remove the screw from the heavy side and undercut it, or trim it from underneath. There are several ways to remove weight but some of them are crude and make the watch look a little ugly. For example you can file the screw down from the outside. Undercutting is a cleaner way to trim weight. One under cutter tool looks like the tool below. Basically you put the screw in the tool and turn the screw like a "cheese grater" and remove tiny amounts of material. Precision screw holders like the ones below make short work of grasping these tiniest of screws. Using a screw driver is a great way to lose the screw. I also took the opportunity to reposition the hairspring in order to lower the beat error. After removing a little weight, the watch has slowed down a little but still has a long way to go. Going a little further, the watch has now sped up nicely. Well, here's the performance after a couple more tries... now the heavy spot is Crown Right. I know that's the heavy spot because that's the position that runs the fastest. Okay, now the heavy spot is crown down. After a few attempts at removing weight I had to start to add weight in other places. This is a very challenging process.. tweak a little, check it out, tweak a little, check it out. After a few more tries, I'm back to Crown Right but the other numbers are slowly getting closer together. I think I might call it a day... it's taken me about three hours of the sort of effort that involves "beads of sweat on the forehead" in order to get to this point. Every time I remove the balance I'm rolling the dice and, to be completely honest, I'm shocked I haven't goofed up this hairspring yet or the balance pivots yet. A slight tweak of the regulator is needed to get the dial up and down rates close to zero. Notice the regulator is almost at the center position. I've pretty much nailed this beat rate, amplitude and beat error. The other positions vary slightly but not by too much as compared to where I started. I'll have to observe the watch in action to see how it performs while being worn but I have to say that I'm pretty pleased with my first foray into this highly specialized technique. I'm glad I don't run across this problem very often though.